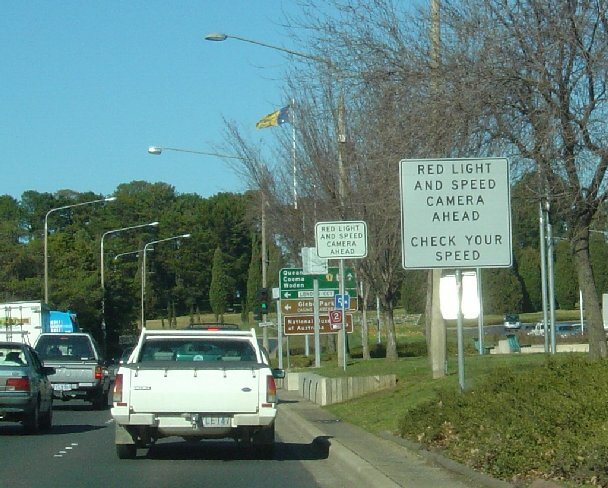 The Chairman of the PCA, Mr Harold Scruby, today called on Roads Minister Carl Scully to introduce Red Light-Speed Cameras across NSW as soon as possible. ”The PCA has been trying to get the RTA to even test these devices for well over 2 years with no success, yet both the Victorian and ACT Governments have been testing and using these devices during that entire period and have now installed them extensively. 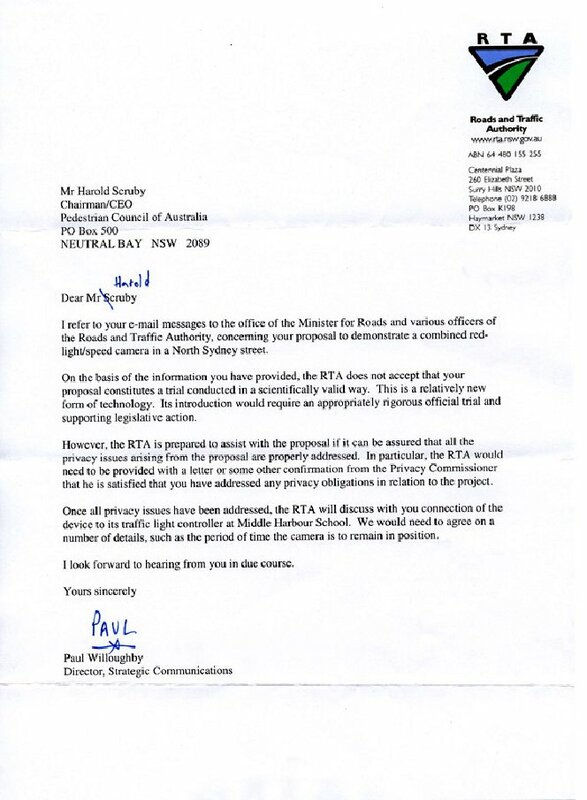 During this period, the RTA has continued to procrastinate, arguing privacy and other issues. 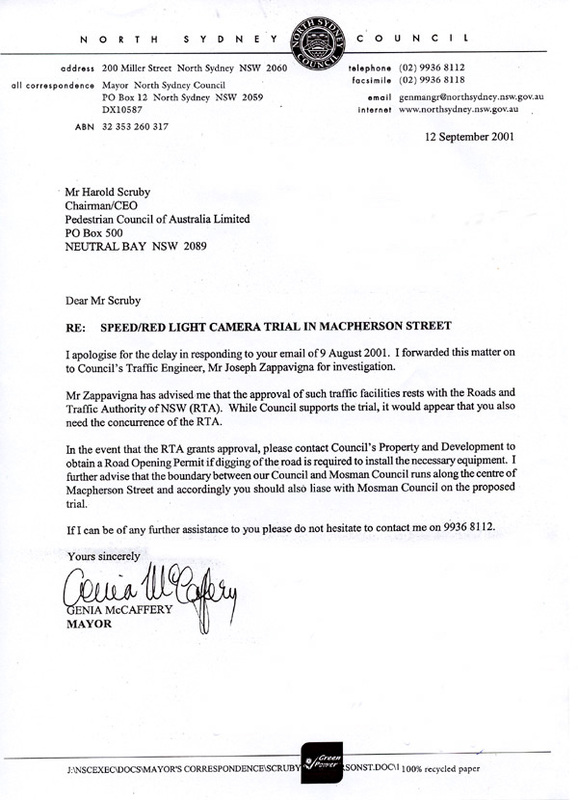 The PCA even obtained the permission of the North Sydney Mayor, Councillor Genia McCaffery, to conduct the trials (see copy of her letter of 12 September 2001 – below). Clearly, if other Australian states and territories can introduce these life-saving devices, there are simply no reasons to continue delaying their introduction, especially when Mr Scully has only 16 months in which to save 820 lives, when fewer than 50 have been saved to date,” Mr Scruby said. On Thursday 11 September, Victorian Police Minister Andre Haermeyer unveiled chilling advertisements promoting the cameras. They carry the theme ‘Think twice before running a red’. Mr Haermeyer said that some people believed they could slow down while driving past a speed camera, and then speed up. "What we want them to do is assume there is a speed camera around every corner, that there's a speed camera on every road, at any time, anywhere throughout Victoria," he said. Acting Assistant Traffic Commissioner Bob Hastings said the cameras would be a vital tool to lower the road toll. Mr Haermeyer said serious injury and death were more common after cross-traffic crashes. One in four fatal accidents over the past five years occurred at intersections. Sixty-five dual-function speed and red-light cameras will begin catching bad drivers across <?xml:namespace prefix = st1 ns = "urn:schemas-microsoft-com:office:smarttags" />Victoria in a fortnight after a hard-hitting advertising campaign began yesterday. Fifty-four cameras, which monitor traffic from all directions, will be in fixed locations, operating 24 hours a day. Another 11 will be rotated through 31 intersections around the state. The cameras will be switched on progressively and all intersections will be signposted. The cameras will catch any motorists who speed and those who run red lights. The dual-function cameras have never been used in Victoria before. Police Minister Andre Haermeyer yesterday unveiled chilling advertisements promoting the cameras. They carry the theme "Think twice before running a red". The advertisements feature a young driver who accelerates through a red light, crashes into another vehicle and ends up slumped over the steering wheel, dead. Mr Haermeyer said tens of thousands of motorists would be caught every year unless they slowed down. "All locations will have a sign advising that there are cameras operating at that intersection and so there's really no excuse for anybody to speed through those intersections," the minister said. "You'd have to be an absolute imbecile to do it." The 85 intersections selected for the cameras were based on accident statistics, Mr Haermeyer said. Between 1997 and 2001, 1055 crashes at the intersections resulted in injuries or death. A motorist captured on camera running a red light will receive a $200 fine and three demerit points. Those who speed through the intersection will also be fined and receive demerit points. It's not just fines and demerit points we want people to think about. It's about causing serious injury and death, to other road users, to yourselves and to your family," Mr Haermeyer said. Mr Haermeyer said that some people believed they could slow down while driving past a speed camera, and then speed up. "What we want them to do is assume there is a speed camera around every corner, that there's a speed camera on every road, at any time, anywhere throughout Victoria," he said. Acting Assistant Traffic Commissioner Bob Hastings said the cameras would be a vital tool to lower the road toll. Mr Haermeyer said serious injury and death were more common after cross-traffic crashes. One in four fatal accidents over the past five years occurred at intersections. Opposition transport spokesman Terry Mulder said he wanted assurances that the cameras were being installed at intersections that had high crash and fatality rates, and not placed simply to maximise fines and revenue. RACV spokesman Michael Case said his organisation welcomed the program and believed intersections were potentially the most dangerous part of the road network. 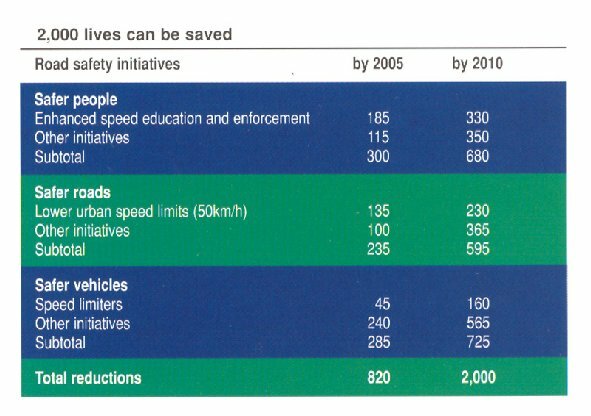 But Mr Case said the revenue from the camera fines should be allocated to road safety initiatives.